The next steps will involve writing some code. We've written up development environment setup in PHP, where you'll set up your dev environment and prepare to build a simple web app. If you haven't yet set up your development environment to write some PHP, head there first to get ready. This quickstart will be waiting. PHP's good - let's write some code! To send a message, use the following code and replace the to parameter in the constructor with the phone number for your personal WhatsApp account in the E.164 format. (If you haven't already, install WhatsApp on your device and register for an account.) 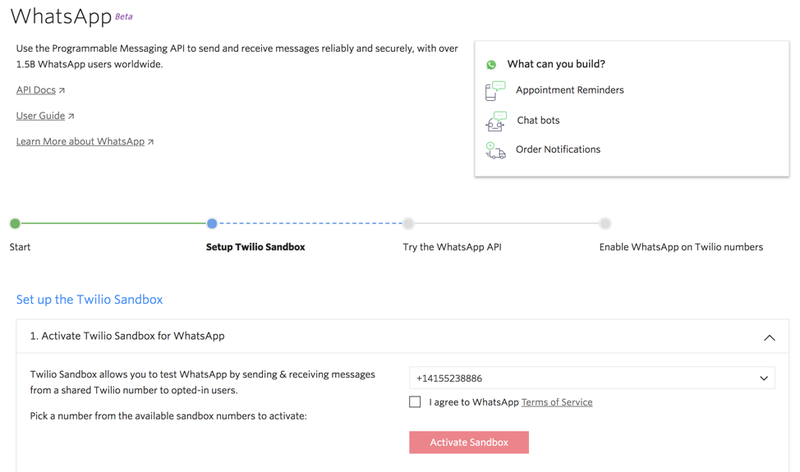 For the from parameter, be sure to include the whatsappsandbox: channel identifier before the Sandbox number in E.164 format. To handle this request, you need to set up a web application and expose it to the internet. The PHP SMS Quickstart shows you how to respond to a message and generate TwiML in PHP. WhatsNext for WhatsApp and PHP?